Caveat : Reports of `mystery' viruses are a staple in India's media, and usually turn out to be something less than initially reported. So until proven otherwise, today's media report of supposed H2N3 cases - while possible - should be taken with a very large grain of salt. Last November in A Couple Of Curious Flu Reports From India, we looked at reports (see Mumbai: Doctors suspect new H1N1 variants) of unusual flu symptoms - particularly among pregnant women - of hypertension, vomiting and diarrhea associated with a `flu-like' illness. No other lab results are mentioned, and the article presented no evidence (beyond citing unusual symptomology) to support their theory. Another article, published at the same time in the Times of India (Influenza 2.0), took a different tack, and instead suggested it was H3N2 - not an H1N1 variant - causing these unusual symptoms, while acknowledging that none of the samples sent to NIV had come back positive for the H3N2 virus. Today the Times of India is reporting on an outbreak they state has tested positive for H2N3 (see Unknown virus claims 64 lives in Indore, India). Since the Times prevents copying and pasting, I've found a second report - one that uses the Times of India as a source - published today in the Gulf News. Dubia: An unknown virus has claimed 64 lives in and around the Indian city of Indore in Madhya Pradesh. As reported by the Indian newspaper, Times of India, the virus has symptoms identical to swine flu. The report further states that according to officials, recently instead of H1N1, samples were found H2N3 positive and medicines given to swine flu positive patients were not effective. My first reaction was that the writer simply transposed H3N2 into H2N3 (easy enough to do), but that doesn't explain the `unknown virus' aspect, or why medicines (presumably oseltamivir) weren't effective. I've checked India's National Institute of Virology website, and can find no corroboration. But then, it appears the site hasn't been updated since December. H2N3 would be a big story, if true (see below). But for now, we have very little to go on. Hopefully we'll get some clarity soon. The progression of human influenza pandemics over the past 130 years is believed to have been H2, H3, H1, H2, H3, H1, H1 . . . . The oldest pandemic we can be certain of was the 1918 `Spanish Flu’, which killed anywhere between 40 million and 100 million people, and was caused by an H1N1 virus, followed by H2N2 in 1957, H3N2 in 1968, and H1N1 in 2009. But before that, the 1890-93 `Russian flu’ pandemic has generally been attributed to the H2N2 virus, while the H3N8 virus has been tentatively pegged as causing the 1900 epidemic (see Transmissibility and geographic spread of the 1889 influenza pandemic). Given this repeating pattern (and with H1N1 and and H3N2 monopolizing the global stage for the past four decades) it wouldn't be a complete shock were an H2Nx virus to reemerge after an absence of more than 50 years (circa 1968). In 2012, in H2N2: What Went Around, Could Come Around Again, we looked at a study conducted by scientists working at St. Jude Children's Research Hospital - published in the Journal of Virology - that concluded that H2N2 could well pose a threat to humanity once again. St. Jude Children's Research Hospital scientists report that avian H2N2 influenza A viruses related to 1957-1958 pandemic infect human cells and spread among ferrets; may aid identification of emerging threats. And over the past dozen years we've seen a handful of H2 flu viruses pop up around the world in a variety of mammalian and avian hosts. In 2017, in H2N2: Everything Old Is Flu Again, we saw a study published in The Journal Of Veterinary Medical Science, which detailed the finding of H2N2 in Siberian Muskrats. (see Genetic characterization of an H2N2 influenza virus isolated from a muskrat in Western Siberia). 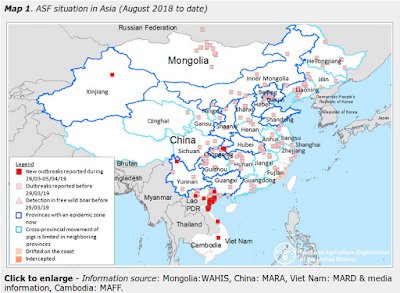 In 2016's A Novel Reassortant H2N8 In China, described an H2N8 avian flu virus was isolated from a domestic duck in Zhejiang Province, Eastern China, in 2013. In 2012, a PLoS One article (Recently Emerged Swine Influenza A Virus (H2N3) Causes Severe Pneumonia in Cynomolgus Macaques) found this swine H2N3 produced greater pathogenicity in a non-human primate than did the human H2N2 virus (see entry below). In 2006 and early 2007, a reassorted H2N3 subtype was detected in pigs on two different Missouri farms, which was the first known appearance of an H2 virus in a mammal since it was supplanted by the H3N2 virus in 1968 (see CIDRAP On Mutated Swine Flu Virus). While H2 viruses have not threatened human health in half a century, it is fair to say they are quite deservedly high on our watch list. So while I have serious reservations over today's reports, we'll be watching this story in the days ahead for some sort of corroboration.